This shirt is a purple-y grey plaid with slight red accents. The horizontal is emphasised, and the colour blocks are wide. It has dark buttons. Dean wears it in Jus in Bello (3x12), from the beginning of the episode until they get out of the police station. He takes it off momentarily after he is shot and Nancy is patching him up. Dean’s had this shirt for a long time! As we see in the flashbacks in After School Special (4x13), Dean wears this shirt when he is a senior in high school. In Jump The Shark (4x19), Dean is wearing it at the beginning of the episode when they get the call from Adam. 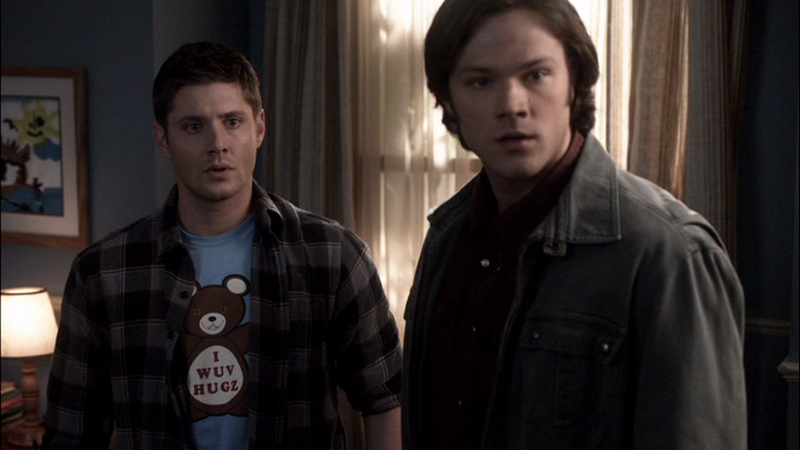 In Dark Side of the Moon (5x16), Dean is wearing this shirt over his “I wuv hugz” t-shirt in the memory from when he was 4 years old. In Mannequin 3: The Reckoning (6x14), Dean wears this shirt at the very end of the episode when he is fixing the Impala at Bobby’s. In Meet the New Boss (7x01), Dean wears this shirt (under his coveralls) while he is preparing to paint the Impala while talking to Bobby about whether or not Sam is okay. He keeps it on when they summon Crowley to conspire, and then changes. In Plucky Pennywhistle’s Magical Menagerie (7x14), Dean wears this shirt at the beginning of the episode as he uses a payphone to talk to Frank. FATE: Dean was shot through the left shoulder while wearing this shirt in Jus in Bello (3x12). It suffers an entry and an exit wound, as well as the accompanying blood stains. Holy cow! Dean still fits in a shirt from high school nearly 10 years later?! That's pretty amazing! And thank you for giving me a smile tonight! I can't believe how you catch these details--how many times do you watch an episode to catch all of it? It depends how much detail I'm trying to see! 1. Episode airs - watch on TV and enjoy, write quick reaction post. 2. Download episode - timeline. 4. Go through caps of episodes - this is a painstaking process where I have to go back through my master indexes of clothing and compare the new clothing caps to older caps to determine whether we've seen the shirts before or if they are new. Other things happen too - like, originally I wasn't capping YoungDean and YoungSam in After School Special, because I figured the clothes would be different...it was really just a miracle that part way through the episode I recognized this shirt...then I had to go back to the beginning and check the whole thing over again. Anyway, long story short: I've always had an eye for details - basically, all I have to do is sit down, tell myself what details I want to notice - and I'll notice them. Haha, aren't you glad you asked? I'm glad I was able to give you a smile! Agreed! That's a very good point.